The majestic sight of mountain desert tumbling into the cobalt-blue Pacific Ocean and Sea of Cortez will mesmerize you. 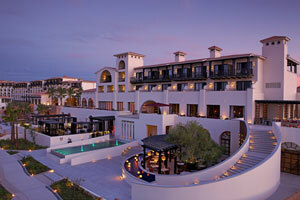 With a Los Cabos vacation package you will find a wide variety of vacation options and hotel choices. Three distinctive hotel zones feature world-class beachfront resorts: lively Cabo San Lucas, laid-back San Jose del Cabo and, in between the two, Cabo's twenty-mile "resort corridor." Scattered through high hills and private coves, the Cabo San Lucas and San Jose del Cabo hotels offer a romantic getaway for couples. There are several world-class golf courses including Cabo del Sol and Palmilla. 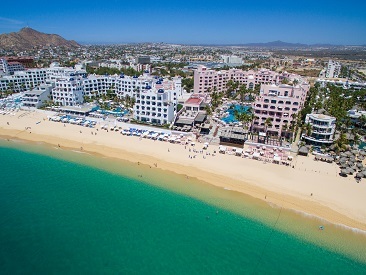 Los Cabos has over fifty miles of ocean and almost every resort is located on a stunning stretch of picturesque beaches. But because this is the Pacific, not all its beaches are swimmable due to swift currents and powerful waves. However, you'll find beaches nearby offering all manner of water sports including jet skiing, scuba diving, parasailing and surfing. If you feel up for a challenge, try reeling in a giant blue marlin on a chartered fishing boat in the marlin capital of the world! You’ll want to conserve your energy though — Cabo San Lucas really heats up when the sun goes down. Dine out at a fabulous restaurant then hit any of the numerous clubs and you'll see why Cabo is famous for its nightlife as well as its incredible beaches. Fronted by safe-swimming Medano Beach, this intimate and hip beachfront hotel caters primarily to singles and couples. Offering prime views of Land's End, ME by Melia Cabo features hot spots the Passion Club and world-famous Nikki Beach Club. An IHG® Green Engage Hotel, nestled between a white-sand beach and the Sierra de San Lazaro Mountains, Holiday Inn Resort Los Cabos is truly “at one” with the environment. At or near the resort, you’ll golf, play tennis, swim and ride horses while younger guests explore the Chiqui Kids Club. To expand your fun in the sun, Cabo San Lucas and San Jose del Cabo are just minutes away. This beachfront all-inclusive resort is an excellent value. Offering an old-world Mexican theme and an unbeatable location, this is a perfect vacation spot for families, couples and singles. Located on a spectacular stretch of beachfront less than 3 miles from the heart of Cabo San Lucas, this beautiful all-inclusive resort is RIU's largest. This is the perfect spot for a getaway in spectacular surroundings for families, couples and singles. Barceló Gran Faro Los Cabos is sublimely situated on the coast of the Sea of Cortez just five minutes from historic San José Del Cabo. The finest choice in all-inclusive Baja California resorts, will treat you to the ultimate Los Cabos vacation experience: close to the fun, far from the stress of the daily grind. Riu Palace Baja California is an adults only, all-inclusive resort set on El Medano beach in Los Cabos. Boasting a wide array of amenities including free Wi-Fi, 24-hour all-inclusive service and four swimming pools, this brand new resort opening December 2018 will be perfect for adults looking for a relaxing getaway. At Reflect Krystal Grand Los Cabos, every guest is guaranteed a luxurious VIP experience in one of the most iconic beach destinations in the world. With your room, you'll receive the very best in resort amenities, as well as access to everything Los Cabos has to offer, from its vibrant culture to its unique natural beauty. The variety of room categories is sure to satisfy what you're looking for in a beachfront Los Cabos resort, ranging from comfortable and relaxing to dazzling and luxurious. But no matter the room, Reflect Krystal Grand Los Cabos is sure to leave you with an unforgettable vacation experience. Setting a new standard for all-inclusive vacations in a spectacular beachfront setting facing one of Cabo's most famous landmarks and boasting two stunning pools. Holiday dreams come true here for couples, singles and families! Villa del Palmar Beach Resort & Spa Los Cabos is located at what seems to be the very tip of the world, in Cabo San Lucas. With its exotic location – facing the legendary El Arco – and its endless list of activities and entertainment, there is something for everyone at Villa del Palmar. The Marquis Los Cabos Resort & Spa is an adults-only, all-inclusive resort on the southern tip of the Baja peninsula in Mexico’s own Los Cabos. With everything from event venues to whale-watching, this resort has the perfect ingredients for your next vacation. Situated at the heart of the Golden Zone in San José del Cabo, only five minutes to San José del Cabo downtown and 30 minutes to Cabo San Lucas, the Hyatt Ziva Los Cabos features more than ½ of a mile of white-sand beach facing the Sea of Cortez and it is the first and only resort in Los Cabos featuring 34 unique swim-up Junior Suites. The iconic 272-room Sandos Finisterra Los Cabos is a legendary property in the “Heart and Soul of Cabo” that has been totally renovated. It has a beautiful pristine beach and is only a short walk from the town of Cabo San Lucas and its renowned Marina where world famous restaurants, shops, nightlife and water sports activities blend together into the world famous Los Cabos flavor. The all-inclusive Paradisus Los Cabos, nestled along the area's only protected safe-swimming beach and surrounded by a spectacular 18-hole golf course, offers guests of all ages an unforgettable, action-packed vacation. 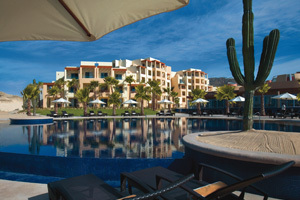 Breathless Cabo San Lucas Resort & Spa is the perfect destination for singles, couples or friends. This adults-only resort comes with a schedule packed with exciting and sensual experiences. Located on Medano beach – the safest swimmable beach in Cabo san Lucas – Breathless Cabo San Lucas Resort & Spa is the chic and relaxing escape you’ve been looking for. You’ll experience around-the-clock parties, 24-hour dining, classes, theme months and so much more. Set in the exclusive community of Puerto Los Cabos, the 500-room Secrets Puerto Los Cabos Golf & Spa Resort offers adults a stunning Unlimited-Luxury® getaway in Mexico’s Baja California Peninsula. The secure community around Secrets Puerto Los Cabos provides striking views of native flora and fauna, and miles of unspoiled Pacific Coastline. Located on the shores of the famed vacation hot spot of Cabo San Lucas, Hard Rock Hotel Los Cabos is set to be completed in 2018. the 639-room property will cater to the diverse needs of modern traveleres, extending diverse offerings to guests of all ages while providing unmatched guest services, luxurious all-inclusive amenities and an exotic backdrop. Le Blanc Spa Resort Los Cabos is a brand-new, all-inclusive, adults-only resort located just minutes away from downtown Cabo San Lucas. At Le Blanc guests will find luxury amenities, fine dining, premiere facilities, oceanfront views and the convenience of being close to downtown Cabo San Lucas. Just a mile from lively Cabo San Lucas, the beachfront Pueblo Bonito Pacifica Golf & Spa Resort, with its cutting-edge, minimalist style, offers a Luxury without Limitations all-inclusive plan providing gourmet à la carte dining, enhanced guest services and an award-winning spa in a calm adults-only environment. Experience the charm of Pueblo Bonito Los Cabos Beach Resort with its Mediterranean architecture, gracious service and glorious views of El Arco and the Sea of Cortez. Situated on the golden sands of El Médano beach, the resort offers delightful beachside dining and a safe-for-swimming beach only footsteps from the door of your charmingly decorated suite. 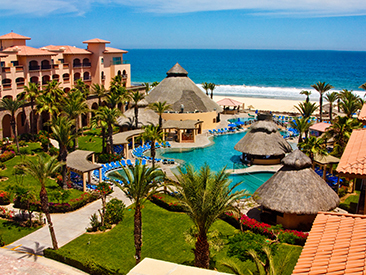 Royal Decameron Los Cabos is an all-inclusive, adults only resort located on the Sea of Cortez. Guests will enjoy the 3 swimming pools, daily and nightly entertainment and nearby golf and Dolphinarium. Nobu Hotel Los Cabos seamlessly blends contemporary Japanese minimalism with locally sourced natural, Mexican materials and finishes. This resort is perfect for couples and families looking for laid-back luxury. Take a dip in one of the four pools and relax in a super cabana. Kids will enjoy spending the day at the Kids Club and adults will take full advantage of the two world-class golf courses nearby. Don’t miss the famous foodies who reside at Nobu Restaurant and Malibu Farm.